Sportradar, a global provider of sports data intelligence, recently joined SVG Europe as a Platinum Sponsor. 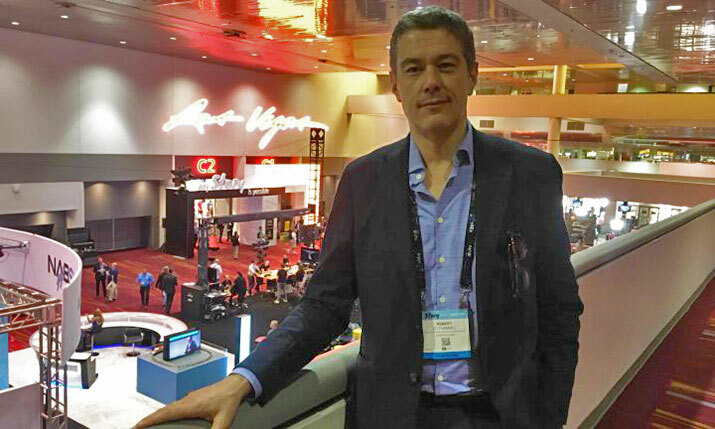 At NAB we sat down with head of commercial product development Robert Zeithammel to learn more about the company’s positioning at the intersection of the sports, media and betting industries, where it provides federations, news media, consumer platforms and sports betting operators with a range of services. “We are a sports data company, collecting and collating all kinds of sports data. We provide services on top of this data like feeds, visualisation, analytics and other services for media clients such as broadcasters, digital platforms, federations and clubs plus betting operators who use this data to manage sports books and generate odds. The OTT landscape in Europe is evolving quickly, with some federations getting into that space and possibly disrupting their existing broadcast partners in the process? “It’s a twofold scenario. The top federations have very lucrative existing licensing deals and want to expand on those. Is there any potential upside in having their own distribution platform and going direct to consumer? Especially so in territories where they don’t have such big licensing revenue through broadcast. A lot of them see, especially in emerging markets, that they can do a better job in promoting this directly. “Meanwhile for smaller federations – sports that want to garner greater interest – it’s a matter of reaching out to their existing fanbase. Some of them have a hard time getting air time in sports broadcasting. To have events covered live works only through OTT and digital platforms for them. People can discover their sport through OTT. “Lots of traditional broadcasters have sophisticated digital strategies as you can’t just do regular broadcasting any more. You have different linear platforms and also all types of platforms around VoD and social media and so on. What does Sportradar hope will be the benefit of joining SVG Europe as a Platinum sponsor? “I think your events are very interesting as an industry meet-up. You are bridging the gap – if there is one – between broadcasters and OTT. It’s always good to have events focused on these technological areas to bring the different stakeholders together. “It’s a very dynamic space and there are a lot of companies providing building blocks to the overall experience. Everybody is looking for new ways to increase the reach and engagement of the audience, and how do you also identify new revenue streams? Sportradar is a partner of more than 1,000 companies in over 80 countries and official partner of the NBA, NFL, NHL, MLB, NASCAR, FIFA and UEFA. It monitors, analyses and delivers insights from more than 400,000 matches annually across 60 sports.